Bus line 9 extends its itinerary to attend the petitions of the Genil district. This new measure will get to Fray Leopoldo retirement home or childhood educational center Carmen Linares. Urban bus line 9 that connects Chana and Rebites districts extends its itinerary adding three new stops to improve bus service in Genil district. 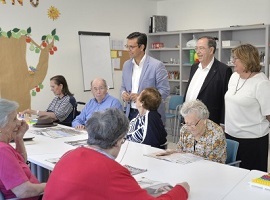 This new measure, that will take effect in a few weeks, will service an area with large influx of urban transport useres, as Fray Leopoldo retirement home or childhood educational center Carmen Linares have. On his visit to Fray Leopoldo retirement home, the major of Granada, Francisco Cuenca, accompanied by the councellor of Presidence, Employement, Entrepreneurship and Equality, Ana Muñoz Arquelladas, has announced that the new rearrangement of this bus line created by the government team will have an extension of bus line 9 with one stop at Andes Square and two at Aconcagua Street, this way we improve and give answer to the petitions and requests of residents, has explained. For Cuenca, this measure is a new way to governing encouraged by the new government team, in constant listening to neighbours, have made a constant and direct participatory process with neighbours. As a result of this open process, it can be added, after meetings with neighbours of district Genil, appropiate technical solutions and we have given answer to their needs in public transport.. The major has remarked that the new rearrangement of urban bus line allows a public service that leave the transfer system applied by old LAC model betting for a door to door user service. Check more info about modification of the itineraries of bus lines 9 and 33. From Monday 10 September, bus lines 9 and 33 turn from Acera del Darro to Paseo de los Basilios directly, withouth reaching to Rotary Square. Also, bus line 9 gets to Andes Square and Aconcagua Street outward way. Buses of lines 9 and 33 go down through Acera del Darro and at Puente Blanco turn left to Paseo de los Basilios, withouth reaching Paseo del Violón to Rotary Square. Buses of line 9, in Rebites-Chana sense, get to Andes Square and Aconcagua Street. There is a new stop in Andes Square and two in Aconcagua Street. Check op map of bus line 9. Check op map of bus line 33. Check all info about urban bus lines.